If you have a flair for visuals and enjoy working with people, a career in costume design could be right up your alley. Costume Design 101 takes you by the hand and leads you, step by step, through the process of becoming a professional Costume Designer for film and television. 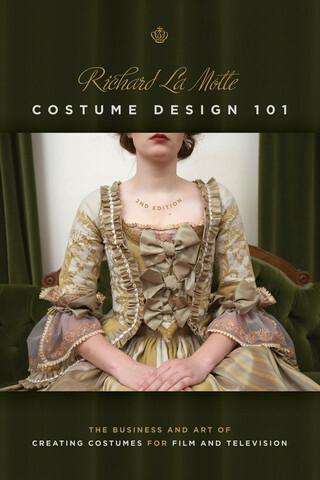 Written by Richard La Motte, an industry veteran with 40 years of experience on many mainstream costume dramas, this expanded and updated edition of Costume Design 101, is a follow-up to the very successful first edition, used by students and professionals alike. The second edition has kept all the essential information while adding new chapters on personal marketing and breaking into the business - a "must have" for anyone serious about the profession of Costume Designer. Starting with how to get into the business, conduct interviews, make costume presentations to producers and directors, break down scripts for requirements and budgets, hire and run costume departments, engage in manufacture, work with rental companies, and run on-set production, Richard La Motte demystifies the design process for the creative Costume Designer. His entertaining, engaging style peppered with firsthand accounts and war stories gives a full overview of the industry, with an emphasis on such practical information as on-set protocol, running a set operation, and the challenges of working on large-scale productions with a high number of extras. Many crucial insider tips are imparted here including which procedures work best, what information you need from other crew members, and what questions you need to ask and will help you operate like an old pro from your first day on the set! Richard E. La Motte has been working within the costume industry for over 40 years, beginning in the costume department at FOX studios in 1966 as an apprentice costumer. He trained with the "old timers" who started their craft during the dawn of the golden age of cinema, the 1930s. He officially became a Costume Designer in 1973, and the early training from the "old timers" gave him the tools to hone his craft as designer on feature films such as: The Wind and the Lion, Rambo III, The Island of Doctor Moreau, A Man Called Horse, Gods and Generals, and Goonies.